Of all the skin types, sensitive skin is not just the most susceptible to age and environmental damage but also one that is the most temperamental, hence the hardest to handle. In fact, if I were to describe sensitive skin, I’d say this is the skin that has a perpetual PMS problem. Yes, it truly is that eccentric! So, establishing a skincare routine that works and sticking to it is vital for those with sensitive skin. The more religious you are about following your skincare routine and using products that work for you, the lesser will be the risk of flaking, redness, rash, hives and inflammation. Simply put, customized skincare is really the only way to put up with the tantrums of your skin. Morning Skincare Routine For Sensitive Skin! Even sensitive skin feels and looks fabulous after a good night’s rest. 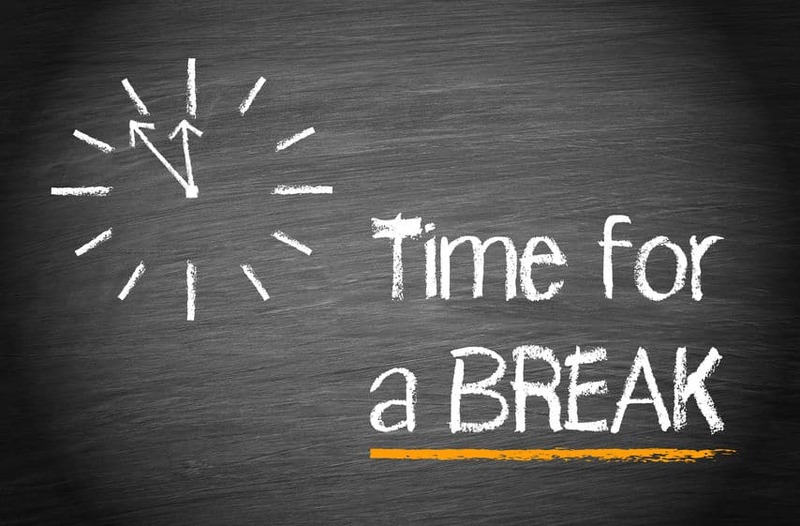 If you get your 8 hours of slumber time, your skin will be less stressed, hence more manageable. That said, the best way to work on sensitive skin at the start of the day is to give it some time to wake up. Splash some water on your face and neck once you are out of bed and dab your skin dry. Go about your morning chores and tend to your skin right after your shower. 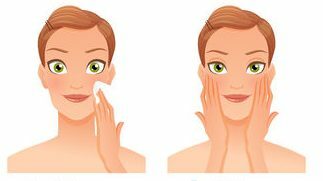 If you have sensitive or dry skin on your face, chances are that the skin on the body won’t be very different. So, stick to using warm/room temperature water instead of hot water for your shower. If you enjoy long, hot showers/soaks, remember that exposure to hot steam for extended periods of time will open your pores and make your sensitive skin more susceptible to allergies. So, before you walk out of the bathroom after your shower/soak, splash some cold water on your face and neck. This will shrink the pores and lower the risk of an allergic reaction, particularly if you intend to use active ingredients in your day skincare routine. 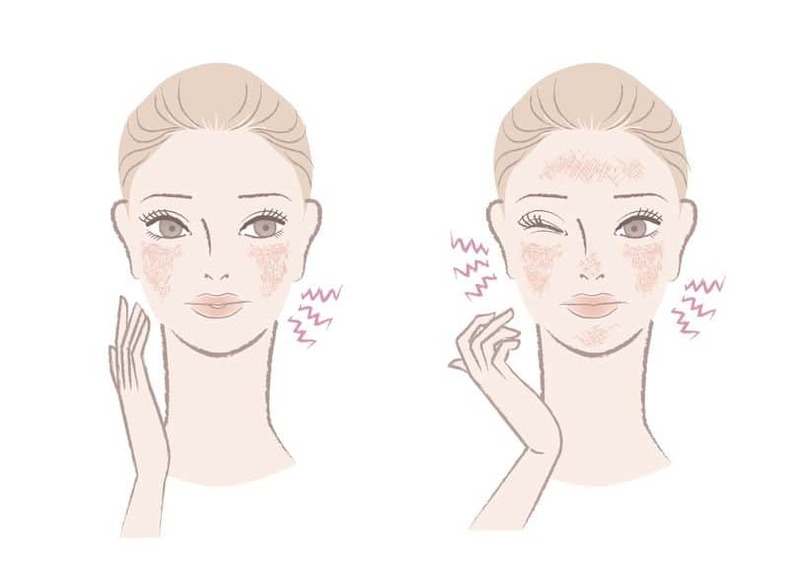 With that bit out of the way, let us start talking about the 4 step routine that you need to follow to keep your skin looking like fabulous through the AM hours. In the morning, start your cleansing with the gentlest product possible, without bothering with exfoliation. A creamy, fragrance and soap free cleanser will help your skin retain its calmness. If you are a DIY person, start with a teaspoon of raw honey. Use it as you would a regular cleanser, massaging your skin with the honey mixed with a few drops of water. Keep working the honey mixture on your skin for about 2 minutes and then wash your face clean with water at room temperature. If you have sensitive skin, the last thing you want to do is irritate it by using water that is too hot or too cold for cleansing. Remember, for sensitive skin neutral is the word, so stay away from anything that signals too harsh. If using a hydrating or creamy cleanser, choose a product that is rich in fruit/herbal extracts (not acids) and other antioxidants. L’orpur Gentle Cleansing Lotion contains flower extracts, essential and carrier oils and is suitable for sensitive skin. Once again, harsh products, particularly those that contain alcohol or acidic compounds or ingredients that cause stinging are definitely out. What your sensitive skin needs is a hydrating and calming formulation. A product that contains calming and healing floral waters, glycerin, squalene, hyaluronic acid and other such humectants would be ideal. L’orpur Rich Anti-Oxidant Toner is designed for sensitive skin and contains sandalwood and jasmine essential oils amongst others. If using pure floral waters, stick to cooling and calming products like helichrysum, chamomile or lavender hydrosols. The essential oils of these botanicals are just as beneficial. To apply the toner of your choice, use a ball of cotton wool soaked in the liquid. Dab it all over your face as opposed to using stokes for application. Alternatively, splash a couple of drops of the formulation on the palms of your hands and apply by dabbing it all over face. Let the toner hydrate your skin for about 2 minutes and move on to a skin serum or a moisturizer while your skin is still damp. Particularly with sensitive skin, layering on too many products should be a strict “no-no”. So, for hydrating and moisturizing your skin, opt for a serum or an antioxidant rich moisturizer. If you must use both products, use one oil based and one gel/water based formulation. Also, make sure that the oil based formulation is not too occlusive rich, meaning it does not leave an evident film of oil on your skin. Want to try a completely oil-free moisturizer, we have it in store! That said, sensitive skin needs protection from environmental factors, so pick a product that has calming and soothing ingredients that don’t irritate the skin but do fortify the dermal barrier that keeps allergens and oxidants at bay. The best ingredients to look for include carrier oils of sunflower, hempseed, sesame seed, watermelon seed, pumpkin seed and sweet almond; jojoba esters, shea butter, extracts of sea weed, algae, green tea, white tea, chamomile, helichrysum, blue tansy, and calendula; antioxidants like curcumin, resveratrol; vitamins E and B-complex and honey, amino acids, ceramides and allantoin. In terms of texture, the ideal formulation for sensitive skin is a light cream or lotion, essentially an emulsion that will supply the dermal layers with fluids and lipids. As far as application goes, once again gentle and neutral are the two words to remember. Massage your skin lightly using upward strokes after covering your face and neck with a thin film of the moisturizer or serum. It is important to understand that using more than the required or recommended amount of a product is not going to yield better results; on the contrary, it may tip the scale from benefits to risks. So, go easy on the moisturizer/serum, particularly products that use a lot of active ingredients. 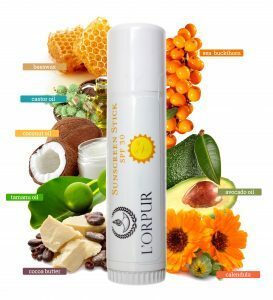 Ideally for sensitive skin, it is best to pick a product with 3-5 active ingredients and no fragrance…the L’orpur Deep Moisturizing Cream is specifically designed for sensitive skin and contains all-natural ingredients, plus one of the most expensive essential oils used in skincare, rose essential oil. One of the reasons for dermal sensitivity is a weaker than normal lipid barrier. With lower protection comes a greater risk of adverse reaction even to regular ingredients because they impact the skin at deeper level than what they should. Actually, those with sensitive skin often have an issue even with their own sweat. 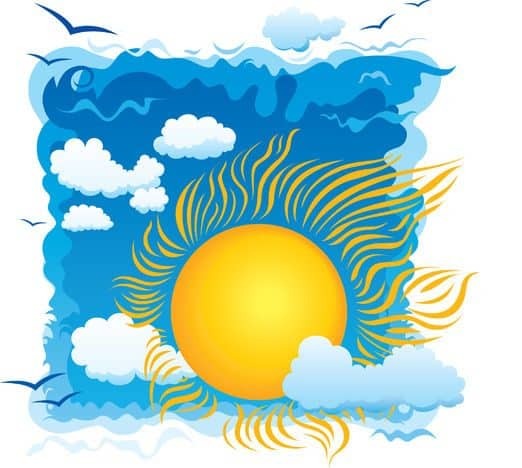 Exposure to sunlight simply exacerbates the problem. So, do not forget to use a high quality, SPF-30 sunscreen even if you intend to spend a few minutes outside. Go ahead and choose a gel based or emulsion based product instead of a heavy moisturizer/cream based sunscreen. If using makeup, pick mineral products and apply sunscreen as the last layer. Dab it on your face and all exposed areas of the upper torso as opposed to rubbing it in. This will keep your coverage/color correction products in place yet offer sun protection. If using the sunscreen under your makeup, wait for 5 minutes after the application of the sunscreen and then use foundation/powder. To Exfoliate Or Not Is The Question! Paeans have been sung in praise of exfoliation in the skincare industry, and rightly so. Even without the addition of skincare products, exfoliation alone can help to boost circulation and tackle the problem of dead cells clogging the surface of the skin and the pores, thus imparting a translucent and radiant look to your face. If you have already read my article on exfoliation, you will know that the process can be accomplished by means of a mechanical or chemical agent. But for those with sensitive skin, both options are out of bounds as anything even remotely harsh will make your skin yell “bloody murder” and break into rash and hives. This approach will not suit you at all if you have very sensitive skin. For those with borderline dermal sensitivity, products with fruit enzymes work better than those with acids, which tend to be harsher on the skin. Needless to say, alpha hydroxyl acids, regardless of their source are not for you! Your options will be limited on this front as well. For example, cleansers that contain fruit pit or nut shell powders, are not for your skin type. A natural gentle cleanser are the safest if you are looking for a commercial cleanser. Alternatively, you could try flaxseed or sesame seed meal as long as the oil seeds are ground to the finest particle size. If using an exfoliating brush, pick a product with the softest bristles possible and use a sonic machine instead of a rotating head cleanser. Again, if you have very sensitive skin, do not exfoliate at all. For low to medium dermal sensitivity, exfoliation should be done no more than once in 10 days or once a fortnight. For those of you who have very sensitive skin, try this easy exfoliating recipe at home. Start with a teaspoon of chia seeds. Soak them in strongly brewed green / white / chamomile tea. Wait till the seeds are turgid and have the gelatinous sheath covering the black core in the center. Scoop out the liquid and the plumped seeds in your hands and rub these gently all over your face. Taking as much of the brew as required to enable easy movement across the skin. 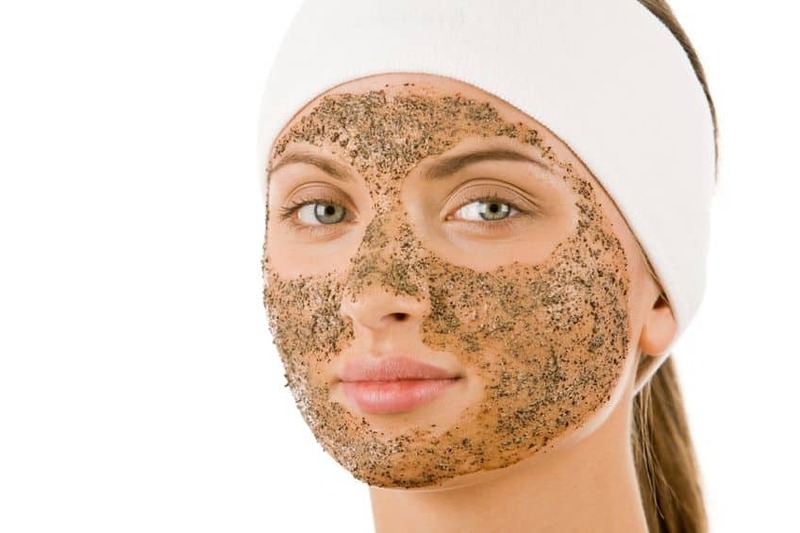 Massage your skin with the seeds and tea mixture for about 1-2 minutes and then wash your face off with cold/room temperature water; pat your skin dry. The one thing I can tell you is that exfoliation certainly does not get gentler than this. Plus, you will get loads of antioxidants from the brew and some of the precious chia seed oil, which will help to keep your dermal sensitivity in check. The problem with dermal sensitivity is that your skin stops making distinctions between truly harmful or damaging substances and normally innocuous secretions and compounds. When I say secretions, I am talking about your own sweat. The sweltering heat of summer, the natural salts in your sweat and the dust and pollen in the environment will all spell trouble for your sensitive skin. So nip the problem in the bud by using gentle thermal / mineral water facial sprays or pure calming hydrosols or cooled green / white tea to dab away the sweat and the dirt. Soak some cotton wool in the liquid of your choice and start dabbing your skin with it. Once you have your face and neck covered with the liquid, dab away at the moisture on your skin with some soft tissue paper. Do not let the hydrosol / mineral water spray dry on your skin because this will cause the loss of natural fluids in the dermal layers and make your skin all the more sensitive. After this, go ahead and give your skin a dose of protection with a light coating of your favorite antioxidant or rejuvenating skin cream or moisturizer. Whether you are using makeup or not, the worst thing you can do for your sensitive skin is rub it. So, although a gentle massage at the end of the day works well to ease away the dermal stress accumulated throughout the day, at other times, stick to dabbing the product on your skin with your fingers. Simply press your palms and fingers coated with the cream on your skin, but use gentle pressure. The biggest advantage of using this method of application is that you won’t mess up your makeup and yet your skin will look like a million bucks. If you intend to head out in the afternoon sun, do not forget the mandatory sunscreen coverage. 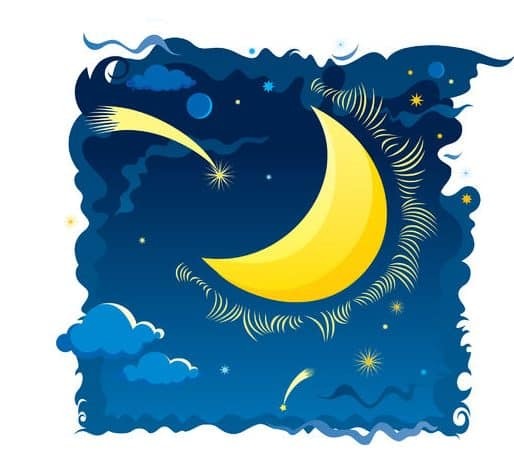 Although your skin does not need much by way of cleansing in the morning, night time is another story. In order for the creams and serums to be effective, you have to start on clean skin, so use a round of oil cleansing to get rid of the dirt, stale makeup, sweat and oxidants. You can also use a gentle foaming cleanser for the task, just make sure it a creamy preparation as opposed to a soap based product that will dry your skin out. This would also be a good time to use a super gentle exfoliating product if they are a part of daily/weekly skincare routine. 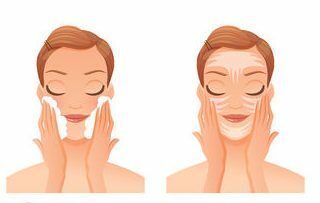 Massage the cleanser / oil on your skin in upward strokes, covering your neck and face and leave the cleanser on your skin for about 1 minute and the oil for about 2 minutes before taking it off. This ensures deep and thorough cleansing. Pat your skin dry after cleansing and spray on a rejuvenating antioxidant toner on your face and neck. If using cotton wool for application, remember to just dab and not wipe your skin with the soaked cotton wool. Once your face is covered in the liquid, wait for about 1-2 minutes which will give your dermal cells enough time to soak up the nutrients in the fluid, without actually drying out your face. While your skin is still damp from the use of the toner, take the recommended amount of serum on your finger tips or the palms of your hands, rub to warm the formulation and then dab it on your skin, pressing it gently into your skin. Once again, antioxidant-rich, replenishing and rejuvenating serums work exceptionally well on sensitive skin as opposed to formulations that contain active, acidic compounds like retinoids. 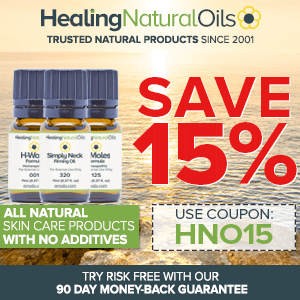 A product that has skin healing vitamins, minerals and botanicals will help greatly in the natural repair process of the dermal layers and will boost cellular rejuvenation. If using a Vitamin C serum, make sure that it contains the gentler form of the nutrient known as magnesium ascorbyl phosphate, which does not cause the redness or the stinging associated with regular Vitamin C but does offer all its benefits. Ideally, a water or gel based serum or a light emulsion would prove beneficial at this point because you will follow it with a moisturizer. If you are using an oil based preparation, then leave out the moisturizer. 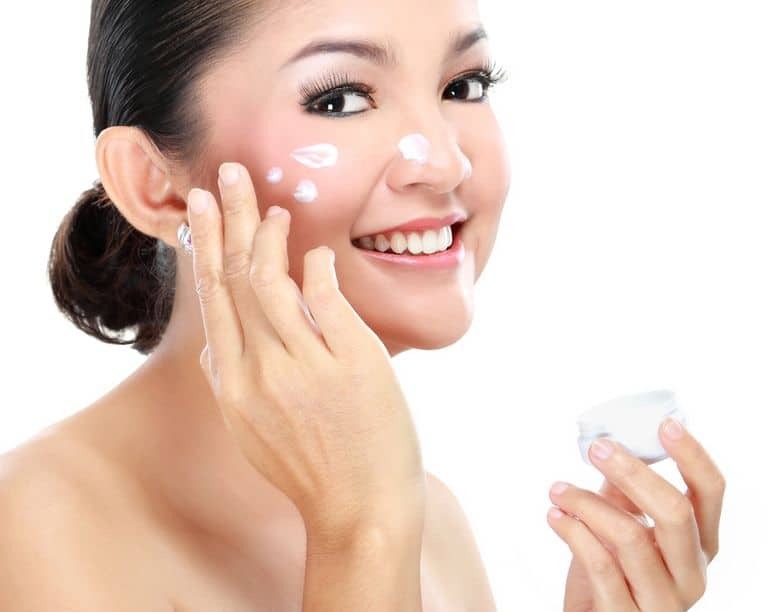 The final coating on your skin should be of your skin healing and calming moisturizer. Formulations that contain antioxidant rich carrier oils and plant butters, which are not too greasy, will protect and moisturize your sensitive skin without clogging the pores. A perfect example is here. So, choose products that contain butter of cocoa, mango or kokum, etc. or oils derived from evening primrose, rosehip seed, grape seed, hempseed, jojoba, etc. All of these emollients are light weight, hence not very high in occlusive value, but they pack in a formidable antioxidant punch. Even if you have sensitive skin, the best way to apply your moisturizer at the end of the day is to use a massager. A roller massager will help to boost circulation and get you better results from both the serum and the moisturizer if used with the latter. Just remember to work your way in upward strokes. Finally, right before bed, gently dab the area around the eyes with some soft tissue paper. This will remove excess lipids and prevent the ingredients from entering the eyes. You can also apply an eye cream or serum (POST) at this stage. We have already discussed how daily exfoliation is not something that will work for your sensitive skin. But this is simply no reason to walk around with clogged pores. Use a face mask that contains mineral rich clay or ash along with soothing fruit and floral extracts to remove dirt and toxins from the skin along with the dead cells on the surface. Once a week application will be enough to keep your skin glowing but do not let the mask dry on your skin as this will pull out the natural fluids that keep the dermal cells plump. Also, the stretching will cause redness and micro tears heightening the risk of allergies. About 6-8 minutes of “on-skin” time will get you the results without the issues if using the L’orpur Nutrient Rich Fruit Face Mask which is perfectly suited for sensitive skin. Try to start your week with a hydrating and replenishing mask. Pick a sheet mask that contains botanical and fruit extracts that soothe and heal instead of a product that is loaded with acids. Alternatively, you can try an all-nighter oil mask. The middle of the week would be the right time for the cleansing treatment. So, reserve the cleansing mask for Wednesday and use it at the end of the day instead of in the morning. The significant temperature changes of both summer and winter are bad for sensitive skin. Similarly, the chilly winds of autumn and the pollen loaded environment of spring can be just as bad and greatly increases the chances of allergic reactions. Protecting your skin from the elements is the only approach that will provide reprieve from hives, rashes, itching and redness. So, always wear sunscreen, reapplying every two hours when out on sunny, summer days. If you suffer from hay fever, talk to your doctor about allergy medication. Use of antioxidants is one of the best ways to keep yourself in top shape. So, amp up your consumption of antioxidant fruits and vegetables plus include formulations that contain antioxidants in your skincare routine. In winter, beat the effects of the dipping temperature by using a skin cream that contains ceramides, humectants and emollients, which will fortify your skin’s natural defense system. If you have sensitive skin, you need to watch out for allergic reactions particularly a week before your period and while you are menstruating. Because the estrogen levels are at their lowest during this time, the skin’s natural lipid barrier stands at its weakest. So, do not use any products that contain preservatives, colors or fragrances. In fact, stay away even from natural fragrances. Also, switch to a richer moisturizer or skin cream and stick to serums / toners, etc. that do not contain more than 3-4 active ingredients. There you have it, everything you need to know about how to take care of your precious sensitive skin, any questions, simply ask! Nice blog. I have a itchy sensitive oily skin. When new acne grow up its feel itchy and after that turn into black spot. I don’t understand which product suit me. Can any one advice for me? Unfortunately, I can’t as I don’t know the cause of your skin issues – please see a dermatologist. As a guy I don’t worry too much about sensitive skin. But your blog reminds me of what my wife does to take care of her skin. Thanks for the reminder.